Engineers from a number of Arab countries will design and build the new 813 satellite, which was announced by His Highness Sheikh Mohammed bin Rashid Al Maktoum, Vice President and Prime Minister of the UAE and Ruler of Dubai, as a gift from the UAE to the Arab countries. The announcement of the new satellite followed on from the signing of the charter for the establishment of the "Arab Space Coordination Group" at the second edition of the Global Space Congress, held in Abu Dhabi this week. The new satellite will be manufactured by a number of Arab engineers from countries that have signed the charter for the launch of the first group of its kind in the Arab world. The 11 countries are the UAE, Jordan, Bahrain, Algeria, Saudi Arabia, Sudan, Lebanon, Kuwait, Morocco and Egypt. 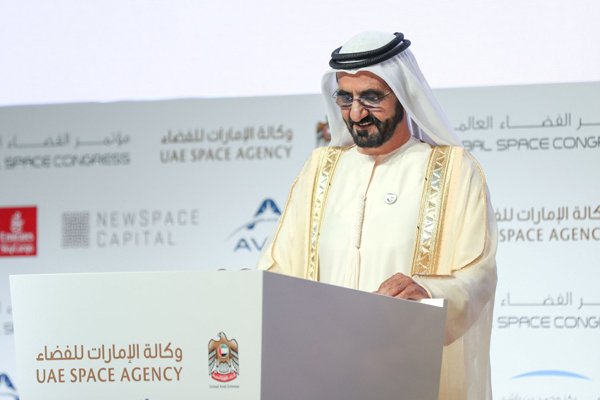 The member countries of the group voted for the UAE to lead the new organization, said the UAE Space Agency. The new satellite 813 is named in reference to the date that marked the beginning of prosperity for the House of Wisdom in Baghdad under the reign of Al-Ma'mun. Representing the region, the House embraced scientists, translated notable texts and produced scientific capabilities. The multi-spectral satellite will monitor the Earth and measure the environmental and climatic elements in a number of Arab countries, as well as vegetation, soil types, minerals and water sources, measuring greenhouse gases, pollution and dust levels as well. The new satellite will be funded by the UAE Space Agency and will be developed at the state-of-the-art facilities at the National Space Science and Technology Center at the United Arab Emirates University in Al Ain, the only research space centre of its kind in the Middle East.